We’re climbing our way up the 2018 fantasy football team power rankings, but today’s group of teams are still outside of the top half of the league. 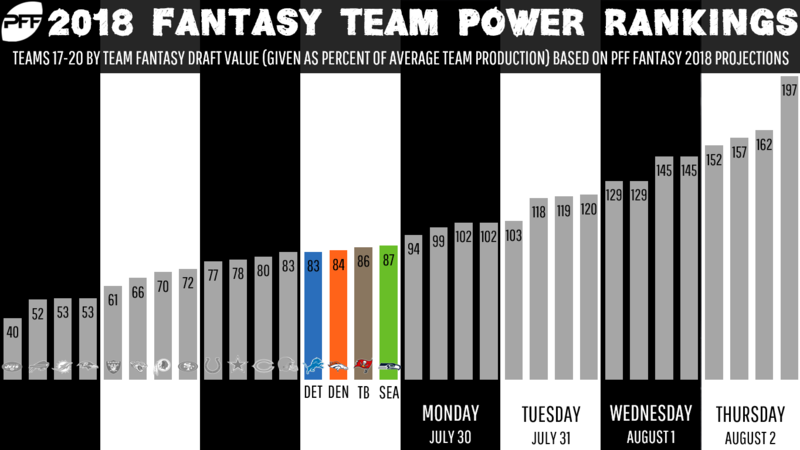 These four teams are all slightly below league average in terms of how helpful they are to fantasy players. As a reminder, these rankings are based purely on how good these teams are from a fantasy perspective — not from a real-life perspective. The Lions, last year’s No. 18 team, haven’t moved much. Detroit checks in at No. 20 on the 2018 fantasy football team power rankings. The Lions have the No. 29 backfield from a fantasy perspective. Detroit’s backfield has seemingly always been a mess from a fantasy perspective, and things aren’t much clearer for 2018. Rookie Johnson projects as the top back, but we actually have him projected to be the No. 38 running back in PPR leagues this year, which would make him a weak flex option. While Johnson is at the top of the heap, he’ll contend with Riddick and Blount for snaps and touches. Riddick is cemented as the team’s pass-catching back, and Blount is a wild card. New head coach Matt Patricia is familiar with Blount from their shared time in New England, and we expect him to be used a fair amount in Detroit. Blount is currently projected for 118 attempts and just shy of 500 yards. He’s draftable in case he becomes the team’s primary goal-line back. Riddick, last year’s No. 26 running back in PPR leagues, ranked tied for 11th among running backs with 53 receptions last year. Riddick doesn’t do much on the ground (he had just 84 attempts last year), but his role is secure. Riddick will be a flex option in PPR formats again in 2018. Overall, despite the trio of options, the Lions have just the No. 29 overall backfield in the league for fantasy purposes. The Lions have the No. 9 wide receiver corps from a fantasy perspective. Detroit is stacked at wideout. Jones (No. 11 last year) and Tate (No. 12 last year) both ranked as fantasy WR1s in PPR leagues. That will be tough to repeat, but we like their odds to produce as WR2s in fantasy this year. One reason why they work so well together is that they are perfect complements to one another. Tate is a slot man through and through, and his 422 pass routes from the slot last year ranked second in the NFL. Jones, meanwhile, emerged as an elite deep threat. His 599 deep receiving yards (on targets 20-plus yards downfield) ranked third in the NFL, behind only Tyreek Hill and Brandin Cooks. Nearly one-third (29.5 percent) of Jones’ targets came 20-plus yards downfield — the fifth-highest rate in the league. Golladay is another deep threat on Detroit’s roster; his deep target rate was actually 33.3 percent. Golladay is likely to be a preseason phenom again, but he’ll struggle to see enough volume to be a weekly fantasy starter. With that said, Golladay is worth a flier late in drafts, and he could be a spot starter in a pinch. The Lions have no fantasy-relevant tight ends you need to know for the 2018 draft. The Lions have the No. 9 group of quarterbacks from a fantasy perspective. Over the past three seasons, Stafford has been steadily climbing the fantasy ranks, posting overall finishes of QB9, QB7, and QB6. We have Stafford projected as a top-10 fantasy asset again in 2018, which should come as no surprise given the fact that his supporting cast of skill-position players — outside of tight end Eric Ebron — has not changed. The Broncos no longer have an elite fantasy offense, but there is reason to believe they won’t be quite as bad offensively in 2018. The Broncos check in at No. 19 on the 2018 fantasy football team power rankings. The Broncos have the No. 21 backfield from a fantasy perspective. Rookie Freeman is the favorite to lead the backfield in touches, but there is a serious risk that a running-back-by-committee will form in Denver, especially after head coach Vance Joseph said the team will use multiple “main” backs. In any event, we like Freeman to be the top man, even if it is via a committee. He has tail-end RB2 appeal if he’s truly the “lead” man — something we’ll likely discover as the preseason unfolds — but he would still be viewed as a flex option in the event that a full-blown committee comes to fruition. Booker will split time with Freeman, although after two years in the league, Booker hasn’t done enough to get fantasy owners excited about his prospects in a committee. He has a career YPC average of just 3.6. He’s a shaky flex option. The Broncos have the No. 12 wide receiver corps from a fantasy perspective. The duo of Thomas and Sanders is still what gives the Broncos the most value from a fantasy perspective. Horrendous quarterback play and injuries last year held these two players back, although it had a far bigger impact on Sanders. Thomas was able to scrape together a WR16 finish, but Sanders fell off the map and finished the year as the WR59. Thomas is a safe bet to finish in that mid-range WR2 grouping again this year, and better quarterback play (from Case Keenum) and health should help Sanders rebound in a big way. Sanders should be viewed as a flex option with WR2 upside. Remember, in 2016 (without Peyton Manning), both Sanders and Thomas finished in the top 20 among wideouts. It can be done. There are no fantasy-relevant tight ends on the Broncos for 2018 drafts. There are no fantasy-relevant quarterbacks on the Broncos for 2018 drafts. Sorry, Case Keenum. The Buccaneers didn’t take the leap forward many expected in 2017, but things are looking better for their offense in 2018 — Jameis Winston’s suspension notwithstanding. The Buccaneers rank No. 18 on the 2018 fantasy football team power rankings. The Buccaneers have the No. 32 backfield from a fantasy perspective. Jones may not offer much in the passing game because Sims is still in Tampa. Sims isn’t an elite receiver, but he’s serviceable to the extent that he’s worth a bye week flex fill-in. The Buccaneers have the No. 8 wide receiver corps from a fantasy perspective. Jackson is being completely overlooked in fantasy drafts this year. He’s a volatile flex option but is a near lock for 50 receptions and 750-plus yards to go along with a few deep touchdowns throughout the year. Jackson is certainly worth drafting, although whether or not you play him on any given week should be matchup-driven. Many in the fantasy community are high on Chris Godwin, but he’d likely have to steal snaps from Jackson to make a noticeable impact. The Buccaneers have the No. 14 group of tight ends from a fantasy perspective. The Buccaneers have Brate and 2017 first-round pick O.J. Howard on the roster, and we expect Brate to be the team’s best fantasy tight end in 2018 — which was the case last year when Brate finished as the No. 8 tight end and Howard finished at No. 16. It’s hard enough for a tight end to see enough volume in an offense to really make an impact in fantasy. It’s really hard when there are two capable tight ends on a roster, meaning each will eat into the other’s opportunity. We like Brate to lead the way again this year as a potential tail-end TE1. But in reality, both Brate and Howard are probably best served as streaming options. The Buccaneers have the No. 12 group of quarterbacks from a fantasy perspective. Over the final five weeks of the year (Weeks 13-17), Winston was the No. 1 overall fantasy quarterback by a significant margin. His 217 dropbacks ranked first in that span, his 1,584 passing yards ranked first in that span, and his nine touchdowns were tied for third in that span. He completed over 71 percent of his passes in that span, which is well above his career average of 60.8 percent. A suspension to begin the year makes Winston undraftable, but he’s a name you need to keep an eye on early in the year on the waiver wire. It was a small sample size, but his performance down the stretch last year showed that Winston has a high ceiling. If he played a full slate of 16 games, his PPG projection would make him a tail-end QB1 option. The Seahawks, last year’s No. 13 team, have slipped a little from a fantasy perspective. They check in at No. 17 on the 2018 fantasy football team power rankings. The Seahawks have the No. 25 backfield from a fantasy perspective. The Seattle Seahawks added a running back in the first round of this year’s draft and they hired a new offensive coordinator, Brian Schottenheimer, who brings a run-first mentality. Just in case you were wondering what the Seahawks were trying to do in 2018. Penny is the running back they took in Round 1, and there’s no reason to think he won’t be the team’s bruiser given the draft capital the team invested. It is obviously worth keeping an eye on Chris Carson in the preseason, but Penny appears primed to be the lead back. If that’s the case, Penny is in a great spot to put up RB2 numbers as a rookie with 250-plus touches. He has RB1 upside if he is utilized even occasionally in the passing game. We have Prosise projected to win the third-down role in Seattle, which would make him a worthwhile flex fill-in, but not a weekly starter. The Seahawks have the No. 16 wide receiver corps from a fantasy perspective. Baldwin, who burst onto the fantasy scene in 2015 with over 1,000 yards and 14 touchdowns, proved the doubters wrong by continuing to put up big fantasy numbers in both 2016 and 2017. He has been a top-15 PPR wideout in three straight seasons, and he’s primed for yet another tail-end WR1 performance in 2018, thanks in large part to the fact he’s the only returning wideout that has any serious rapport with Wilson. Lockett remains a part of Seattle’s pass-catching corps after the departures of Paul Richardson and Jimmy Graham. Lockett was supposed to be a fantasy break out a few seasons ago, but an ugly injury in 2016 set him back. Lockett has the opportunity to break out in 2018, though, given the lack of other options in the team’s passing attack. Lockett saw seven end zone targets last year, which was third on the team behind Graham (20) and Baldwin (nine). Given the amount of red-zone looks that will now be available given Graham’s departure, Lockett seems like a good bet to improve on his two touchdowns — and potentially improve on his career high of six scores (from his rookie year). There are no fantasy-relevant tight ends on the Seahawks that you need to know about for 2018 drafts. The Seahawks have the No. 4 group of quarterbacks from a fantasy perspective. Wilson returns in 2018, and despite the fact the Seahawks appear to be going back to the run more this year, Wilson should still be viewed as a top-five fantasy quarterback. In three of the past four years, Wilson has posted top-three numbers. Last year, he was the top-scoring fantasy quarterback by over 46 points.